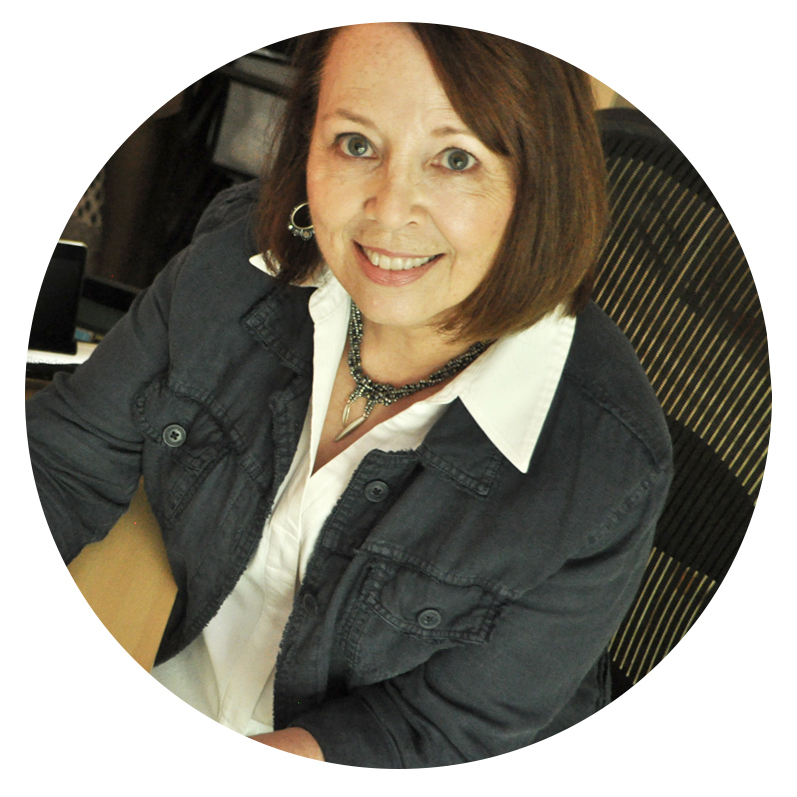 I'm so happy that Michelle Buettner of MiShelDesigns decided to give pearls the spotlight in today's blog hop. Michelle's invitation was the nudge I needed to tackle a project I've been trying to bring to the top of my to-do stack for almost two years. That's how long ago I purchased the pattern for Shelley Nybakke's Satisfaction cuff. Substantial and statement-making (you won't find anything prim or stuffy at Shelley's Sturdy Girl Designs), the cuff uses Swarovski crystals and pearls to create texture and sparkle in built-up layers of right angle weave. Once I completed the gunmetal base and had the outer channels filled with crystals, I began to question my original plan to use black pearls in this design. 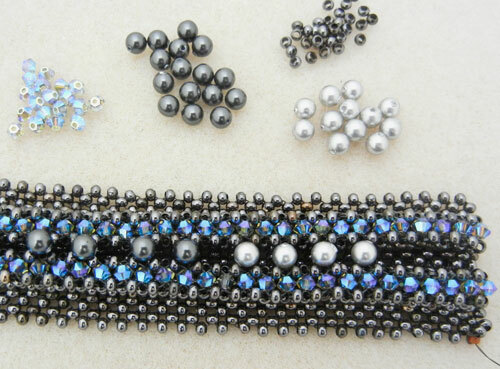 Side-by-side, the black brings drama to the piece, but the gray pearls add their own light and glamor. For my own Satisfaction, I intended to stray a bit from Shelley's design of alternating pearls and crystals in the center channel. So I compromised by using Light Gray in the pop-up sections of pearls/crystals, and Mystic Black in the recessed sections of sterling spacers and pearls. Drama and glamor - now that's a double dose of satisfaction! I purchased the pearls for this design at The Beadcage in Columbus, Georgia. The Beadcage is a Swarovski distributor and always has a well-stocked and totally tantalizing wall of pearls to choose from, a great choice if you live in the Atlanta area. Soft and classic, or saturated and edgy, pearls are everywhere this Fall - click the links below to see how today's participants are mixing them up in their designs. Beautifully stitched,in very nice colors. Gorgeous braclet! I agree with the design change it makes a statement but is not over powering. I am going to have to drive over to Columbus and check out that bead store I am just 1.5 hours away from there. Dramatic and inviting all at the same time. Really lovely work. Oh man - this is totally awesome! I love your work - amazing. (Have you heard me gush about loving everything you all do w/these tiny seed beads?!) I'm also completely in love with your color palette because it's so me. Black/gray/blues/silvers - my go to colors all year round - for jewelry, clothes - everything! I think your choice of color change is perfect. And, I have a feeling that this bracelet feels pretty awesome to wear too! Thank you so much for joining in this hop - I hope you had fun! Absolutely, this bracelet makes a statement! "I'm stunning, aren't I !" All it needs is that little black dress and you're good to go. Love it! I love this bracelet, the layers of beads, pearls and crystals are beautiful. Wow! Gorgeous bracelet, love what you do with pearls!!! This bracelet is beautiful. I so admire anyone that can do Beadwork! Just lovely! That is breathtaking! Love the colors you have used here! 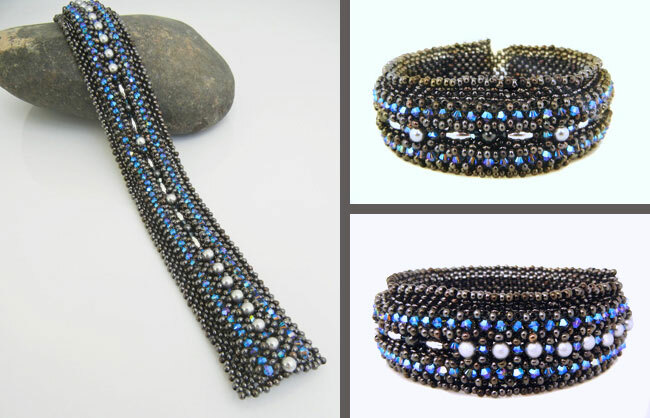 Dramatic, elegant, edgy, substantial~this bracelet has it all, and with your top notch bead weaving to round it all off! What a wonderful design by Shelley. I like how you put your own little twist on it. This must feel REALLY good on your wrist! Just Gorgeous, Karin! Very striking and dramatic! I need to get back to right angle weave! Hi Karin. I love the blues and blacks together. It is one of the hottest color combos for this fall - you are right on trend! I would wear this is a heartbeat! That's some seriously beautiful sead beading and use of pearls! I love the light and dark grays together! That is way cool! So elegant and sophisticated! I love the colors. Great job. Thanks for Sharing! Gorgeous bracelet - love the colors!